Twenty years ago, new passenger car crash tests were mandated which have dramatically improved road safety across the European Union (EU). Applied from October 1998, front and side impact standards have cut vehicle occupant deaths in Europe by half and saved tens of thousands of lives. The same crash tests, subsequently adopted as United Nations regulations, are now the most important benchmarks for occupant safety around the world. Their adoption, despite strong opposition from the automotive industry, represents a major victory for evidence-based research and for high standards of consumer protection. To mark the twentieth anniversary of the EU crash test legislation Global NCAP has carried out a car-to-car crash test of one of Europe’s best-selling models, the Ford Fiesta; one dating from 1998 and the other a current model, both travelling at 64 km/h. The dramatic results demonstrate the huge improvement in occupant safety that has occurred over the last twenty years. The bodyshell of the 1998 Fiesta collapses risking fatal and serious injuries to the driver and passengers. In contrast the modern Fiesta withstands the impact very well with minimum risk of life threatening injury. See film of Fiesta car-to-car crash test here: youtu.be/vFSZxlaCAOw. But such a significant advance in car safety did not come easily. This anniversary article tells the story of the struggle to adopt the crash tests in the EU and how today they are continuing to transform car safety around the world. In the mid 1990’s over 45,000 people were being killed in road crashes annually across the EU. Data showed that frontal impacts accounted for two thirds of all fatal and serious car crashes. Each year over 15,000 people were killed in frontal impacts and a further 6,500 in side impacts. However, research led by the UK’s Transport Research Laboratory (TRL) for the European Experimental Vehicles Committee1 (EEVC) confirmed that tens of thousands of fatalities could be avoided by the adoption of new front and side impact crash tests. Two reports published by the EEVC in 1993 and 1994 provided clear evidence of the urgent need to upgrade the EU’s out dated crash test legislation2. Since the 1970s the EU had relied on a test standard that impacted a car into a solid wall at 50 km/h3. The test prescribed the maximum rearward and vertical displacement of the steering wheel but failed to assess the deadly effect of a collapsed occupant compartment, exposing both driver and passengers to life threatening head, chest, and leg injuries. There was no requirement for instrumented dummies to measure injury risk, encouragement of air bags, or avoidance of dangerous intrusion into the passenger compartment. And there was no side impact test at all. The need for a radical overhaul of the EU’s car safety legislation was obvious and it was the EEVC’s task to develop new and evidence-based test methodologies. Under the leadership of vehicle safety experts Professors Richard Lowne and Adrian Hobbs, TRL then began to determine the best procedure for a new frontal impact regulation. The aim was to replicate real-world crashes involving a 50% overlap car-to-car impact at a speed of about 50 km/h and this was done by crashing three different popular car models in a series of 32 experimental tests. TRL’s work highlighted the inadequacies of the existing EU test standard which involved crashing a car ‘head on’ into a solid wall. The impact caused the vehicle’s stiff forward facing longitudinal members to hit the wall symmetrically, evenly absorbing the energy of the impact. But this was unrealistic as, in real world crashes, car-to-car impacts are more often asymmetric with only a partial rather than full overlap. The stiff structures of the car penetrate deeper into the impacted vehicle transmitting the energy deep into the vehicle resulting in deformation of the occupant compartment and causing catastrophic life-threatening injuries. To prevent such dangerous intrusion TRL developed a new test procedure using an offset deformable barrier (ODB) with two key characteristics. Firstly, the impact covered only 40% of the car front, and secondly, the barrier was faced with a honeycomb layer to represent the soft easily deformable structure of the impacted vehicle. These features ensured an asymmetrical loading of the vehicle and deeper penetration of crash energy forces. The tests confirmed that the 40% ODB barrier was the best reproduction of real-world car to car impacts and proposed that it be introduced initially at test speed of 56 km/h4. The report noted, however, that cover a significant range of serious and fatal injuries a higher speed of 60 km/h would be necessary. See ODB film here: youtu.be/btlKfobnLFs. TRL also led the EEVC’s research project for a new side impact test procedure. Work on a mobile deformable barrier (MDB) acting as the ‘bullet’ vehicle, and on improved dummy biofidelity in lateral impacts, had been underway since the late 1980s. By 1994 the EEVC was ready to issue its recommendations. They proposed a moving barrier with a ground clearance of 300 mm hitting the side of the tested vehicle at 50 km/h. The height requirement was very important as research finalized as long ago as 1989 had proved that to reduce the risk of chest and pelvic injuries the moving barrier should hit above the door sill – a stiff structure that is usually an integral part of the vehicle bodyshell at the bottom of the door frame. After such extensive scientific validation, it was fully expected that the EEVC reports would form the basis of new EU crash test legislation. However, when the European Commission tabled the draft Directives in December 19945 it emerged that the EEVC recommendations had been diluted and delayed. Under intense lobbying pressure from the Association of European Automobile Manufacturers (ACEA), the Commission had relegated the tougher and more realistic front and side impact tests to a vague ‘second stage’ that would only happen after yet more research. Rather than immediately apply the 40% ODB frontal impact test, the Commission proposed to adopt an entirely different test. This envisaged an impact into a 30% angled barrier favoured by the ACEA. It represented an awkward compromise between the inadequacies of the 100% overlap into a solid wall and the much more demanding ODB proposal. It introduced a limited element of asymmetry to the test but failed to simulate real world crashes or address the issues of intrusion identified by TRL’s research. It was also widely known that most car models would easily pass the test and would not generate significant injury reduction. This dismayed the experts of the EEVC who also disputed the need for further evaluation of the ODB procedure6. Lending weight to their argument was the fact that in 1995 the ODB procedure was already being used at the higher speed of 64 km/h by the Insurance Institute for Highway Safety in the US and by the recently formed Australian New Car Assessment Programme. Not unreasonably, they argued that if the ODB test was working effectively in these consumer test programmes, it was certainly ready to be applied immediately to a new EU frontal impact regulation. Disappointingly the Commission’s proposal for a new side impact procedure was also weakened. The ground clearance for the mobile barrier was set at 260 mm. This lower height level, aligning the impact with the stiffer door sill, would make the test far easier for manufacturers to pass. In contrast the higher level of 300 mm proposed by the EEVC was intended to hit the softer structure above the door sill and be more challenging for industry to prevent occupant compartment intrusion. Remarkably the Commission conceded that “there were no experimental research results to validate a ground clearance of 260mm” and further admitted that although 300mm “did have a basis in research, industry with the support of Member States argued that the barrier height should be nearer 200mm”. The European Commission’s failure to act on their own research and their concessions to the ACEA, shocked many advocates for improved road safety. In response, a campaign coalition was established by the European Transport Safety Council (ETSC), the European Consumers Organisation (BEUC), and the worldwide motoring organisation, the Federation International de l’Automobile (FIA). Together they were determined to defend the EEVC’s crash test recommendations and overcome the risk of corporate capture of the EU’s vehicle safety regulations. Whilst the car manufacturers were successful in watering down the Commission’s original proposal they failed to anticipate how the European Parliament (EP) would react. This was a significant mistake as, under the terms of the 1991 Maastricht Treaty, the European Parliament had gained stronger powers to adopt binding amendments to draft legislation. Thanks to the new treaty a new opportunity emerged to block the efforts of ACEA to delay the EEVC’s life saving recommendations. Together, ETSC, BEUC, and the FIA called on Members of the European Parliament (MEPs) to strike a blow for improved car safety by amending the Commission’s weak and unsatisfactory proposals. Using the compelling evidence of the EEVC reports they quickly succeed in obtaining the support of Alan Donnelly, the British MEP for Tyne and Wear who was the principle rapporteur for the legislation. In March 1995 the crash test legislation was first debated in a special parliamentary hearing in advance of the usual Committee and Plenary votes required for such Single Market legislation. In a deliberate ‘coup de theatre’ the Ferrari Formula One driver Gerhard Berger was requested by Max Mosley (then FIA President) to speak at the hearing together with Professor Hobbs of TRL. Their compelling evidence, despite the technical complexity of the issues, ensured extensive European wide news coverage of the life and death issues at stake. In his role as rapporteur Donnelly then tabled amendments to the draft Directives to delete the Commission’s weakened proposals (the angled barrier frontal test and 260 mm barrier clearance) and replace them with the test procedures proposed by the EEVC7. Meanwhile ETSC, BEUC, and the FIA encouraged a grassroots campaign among MEPs to build support for the Donnelly amendments. The result was a unanimous vote in favour agreed by the EP plenary in June 1996. Caught in the glare of publicity and reluctant to be complicit in ACEA’s delaying tactics, both the Commission and Member States duly accepted all the Parliament’s amendments. In a major defeat for the industry the new tougher crash test standards entered into force from October 1998 for new models and from 2003 for all cars in production. 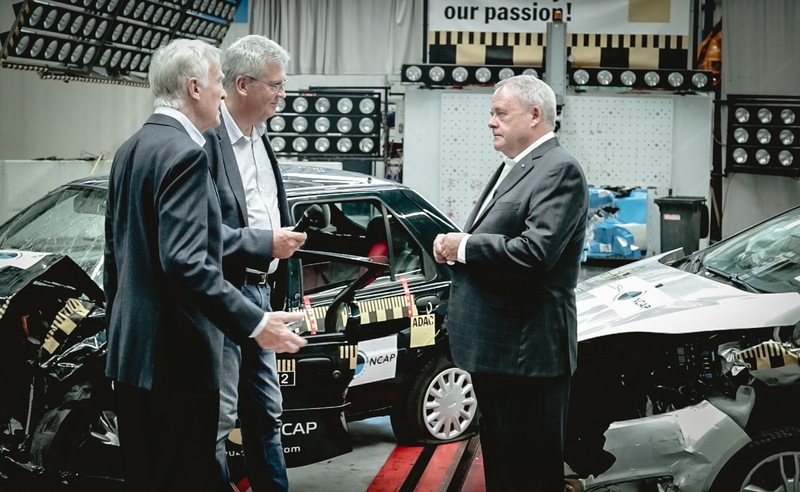 In parallel to this important legislative victory, the European New Car Assessment Programme (Euro NCAP) was launched in 1997 using the EEVC crash test procedures as the core of its consumer vehicle safety rating system. For the frontal ODB test, however, Euro NCAP chose to use the higher speed of 64 km/h (40 mph). Moving to the higher speed was consistent with the EEVC’s original recommendations, as it better represents the risk of fatal injury in a crash and makes it easier to comparatively rate manufacturer performance. The first results were launched at TRL in February 1997 and sparked strong media interest. One of the cars tested, the Rover 100, completely collapsed demonstrating all too clearly the inadequacy of the prevailing levels of crash protection. Twenty years on, however, most manufacturers now routinely aim to achieve strong Euro NCAP results. Over 87% of cars sold in the EU have a Euro NCAP rating and 79% achieve the top-level score of five stars. This has driven passenger car safety far above the regulatory requirements enforced in 1998. Euro NCAP’s rating system has evolved to include advanced crash avoidance systems such as electronic stability control (ESC) and autonomous emergency braking (AEB). In the EU the days of Rover 100 death traps are well and truly gone. And best all it has been estimated that the combination of EU legislation and Euro NCAP crash ratings have saved around 78,000 lives since 1997. Today, although it is still unacceptably high, 25,000 (not 45,000) people die in road crashes across the EU which is now the safest road network in the world. The 1998 crash test regulations have not just dramatically improved EU car safety but are continuing to be the gift to road injury prevention that keeps on giving around the globe. Both the EU’s front and side impact standards were subsequently adopted by the United Nation’s World Forum for Harmonisation of Vehicle Regulations – numbered Regulations 94 and 95 respectively. And today rapidly motorising countries in Latin America and Asia are adopting these same regulations, twenty years after they first entered into force in the EU. The ODB frontal impact regulation is now applied in Brazil, China, India, Malaysia and in Mexico from next year. And just as the EU has benefited from the life-saving impact of improved car safety so will these countries too. For example, in 2015 a TRL study commissioned by Global NCAP showed that in just four Latin American countries (Argentina, Brazil, Chile and Mexico) over 440,000 deaths and injuries could be prevented by 2030, saving $143 billion, if they fully apply the UN crash test standards and support the work of Latin NCAP. The global adoption of UN regulation 94 and 95 will gradually eliminate the large number of sub-standard cars still being produced by car manufacturers in emerging markets. But it remains a shocking example of double standards that some international car companies are today prepared to sell new models that they know would fail crash tests already applied for twenty years in the EU. To highlight this scandal of sub-standard cars, the Global New Car Assessment Programme, supported by the FIA Foundation and Bloomberg Philanthropies, has encouraged governments and manufacturers to act on vehicle safety regulations. And we have helped to establish new NCAPs and safety rating projects in Asia, Africa, Latin America and India to give consumers the information they need to buy the safest cars they can afford. This work has exposed top selling ‘zero star’ sub-standard cars sold today in major emerging markets that collapse just as catastrophically as the 1998 Ford Fiesta in our anniversary car-to-car crash demonstration. But the days of these death traps are numbered as more and more countries apply UN crash test standards. Improved vehicle safety is a major pillar of the current UN Decade of Action for Road Safety and a priority of the UN General Assembly. In April this year, for example, the Assembly adopted a resolution endorsing the call made by the UN Secretary General Antonio Guterres, to “support the elimination of the production of unsafe cars and implement the United Nations vehicle safety regulations or equivalent national standards”8. So what are the major lessons from this twenty-year success story of improved car safety? Firstly, that evidence-based research is the essential basis of effective regulation. Secondly, that the legislative process must be open and transparent to counteract the risk of corporate capture of the regulatory system. Thirdly, that best available technology and high levels of consumer protection should always be the regulators first choice as they encourage innovation and provide the greatest life-saving potential. Fourthly, that regional and global harmonisation of vehicle regulations offers economies of scale that can raise levels of safety worldwide. And finally, that independent consumer testing of the kind carried out by New Car Assessment Programmes acts as a powerful stimulus for industry to exceed legislative requirements. Over the next twenty years car safety will be transformed again by advanced technologies for driver assistance and greater vehicle autonomy. We will move from saving lives during a crash to avoiding the crash entirely. But as we make this transition to even safer vehicles, the lessons learned from legislating for EU crash test standards must not be forgotten. For they represent best practice in achieving life-saving improvements in vehicle safety. And we will need similar bold and decisive action in the decade ahead as we strive to halve road traffic deaths and serious injuries, not just in the EU, but across the world. 1 The EEVC comprised national research laboratories from France, Germany, Italy, Spain, Sweden and the UK. 2 EEVC Working Group 9 Side Impact Test Procedures Final Report 1993 and Working Group 11 Report on the Development of a Front Impact Test Procedure 1994. 4 See: EEVC Working Group 11 Report paragraphs following heading ‘Conclusions from Test Results’ page 12. 7 European Parliament Reports A4-0160/95 & A4-0161/95 Rapporteur: Alan John Donnelly 26 June 1995.